Flowing gown at Mark Kenly Domino Tan. 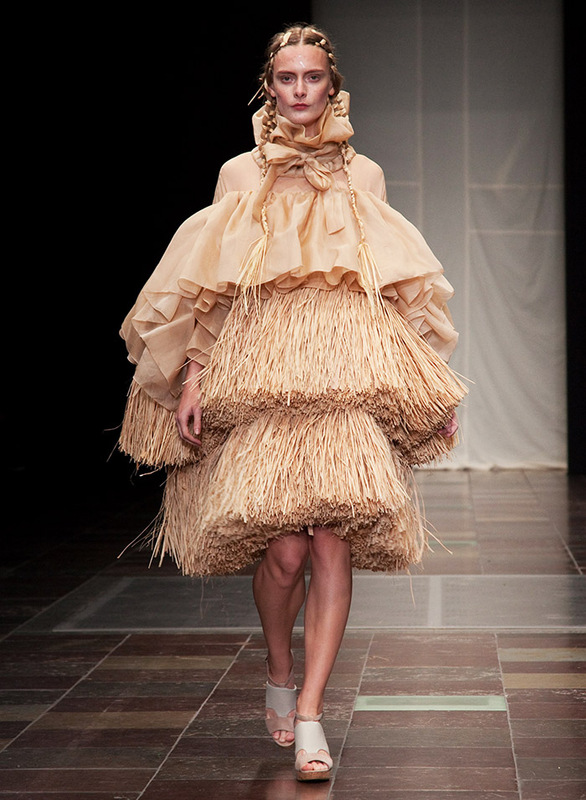 ESTABLISHING an influential place among the other important fashion events in European capitals, Copenhagen Fashion Week is attracting press and buyers from around the globe. Known for a laid back and effortless style, this season there were over sized designs again but this time with bolder colours and some serious chic. One trend dominated the catwalks: the genderless look – a fast and growing theme in the fashion world, especially in Europe. It has been a very strong element in past seasons at Copenhagen. 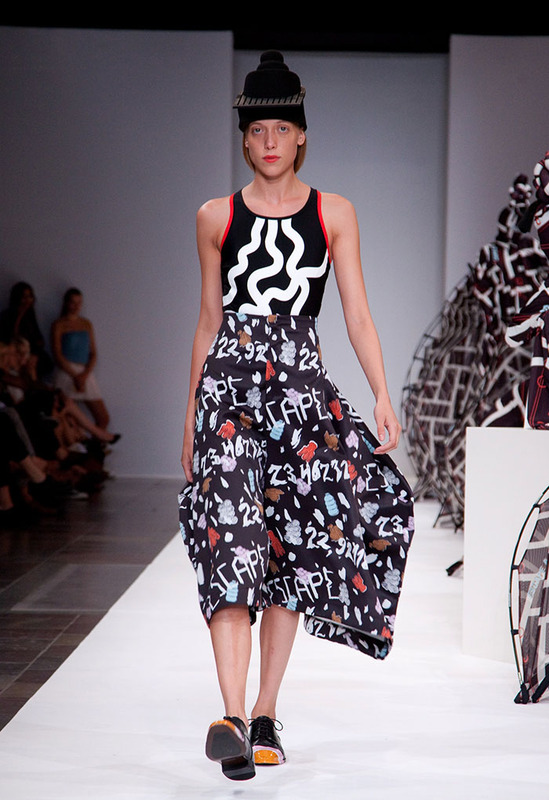 Designers featured both men and women in their shows while clothes and models blended together. Known for her androgynous creations and for not following fashion trends Barbara I Gongini didn’t disappoint this season. She sent out on to the catwalk, mysterious, Gothic silhouettes, but this time surprising us by adding pale elements to her collection such as striped white pieces and matching trainers. Other colours appeared in the form of bright blue sneakers, which certainly stood out in the sea of monochrome, and added a touch of freshness to the dark collection. The abstract genderless pieces included tailored jackets, over sized t-shirts along with wide-legged jumpsuits all created with strong geometric cuts. 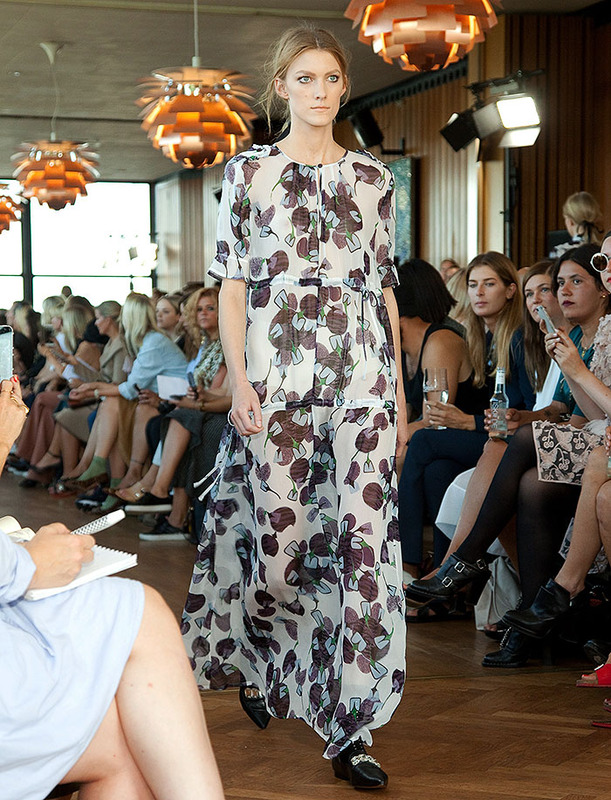 We could see a lot of layering with the use of sheer materials, leather details and straps, all teamed with heavy asymmetric and bold abstract jewellery that fitted perfectly to the no-nonsense feel of the collection. 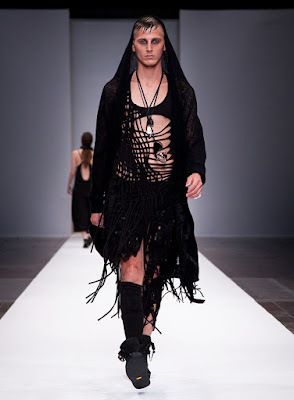 Last season Asger Juel Larsen offered a rock and roll collection. 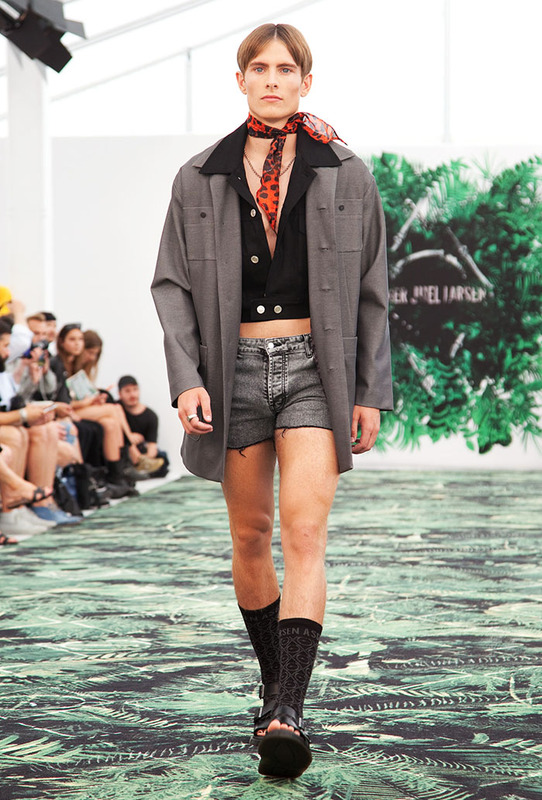 Winner of the European International Woolmark Prize for menswear, the designer’s presentation for SS16 had a lot of 70’s jungle fever and less romantic looks. With his signature elements of sportswear mixed with tailoring, AJL presented a strong androgynous collection with garments such as cropped tops, slick pants, textured leather and some very short shorts mixed. 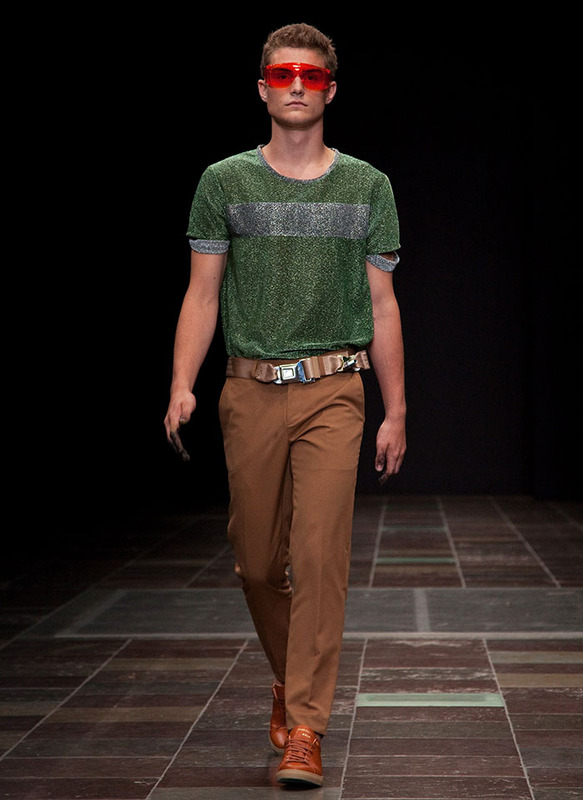 The patterns of the materials included jungle leaf prints in deep greens and fiery oranges. All teamed with Huckleberry Finn scarves, and with a “socks-in–sandals” look which which added to the whole fresh feel of the collection. 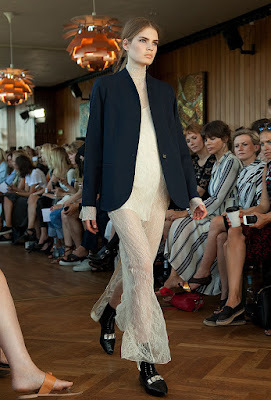 Henrik Vibskov’s SS16 collection continued to combine his men's and women's shows together in a unified mix of looks. The collection, called “The Hot Spray Escape” was all about exploring the human survival instinct and our search for spiritual calmness and physical perfection. It demonstrated survival in the desert through different symbols and textures with bold geometric patterns, abstract prints, vertical lines and polka dots, and a lot of reverse layering, transparency and sheer panelling. Most of the collection was kept black and white with some contrasting colour and elements such as curved lines and circles and the transparent materials adding a touch of elegance. Vibskov said the plan was to have a collection purely based on white, but while creating it, the designs slowly became more colourful. 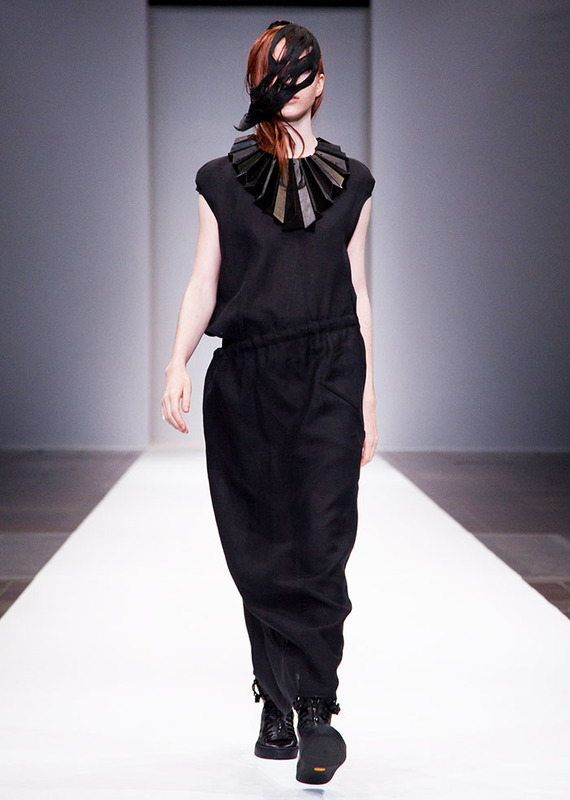 This season Vibskov presented a new collaboration with iconic Danish swimwear brand H2O. The designer created his first swimwear collection for the brand, known for mixing sporty and functional, which goes well with Vibskov's own designs. Two-dimensional wool hats were a creative nod to desert landscapes. 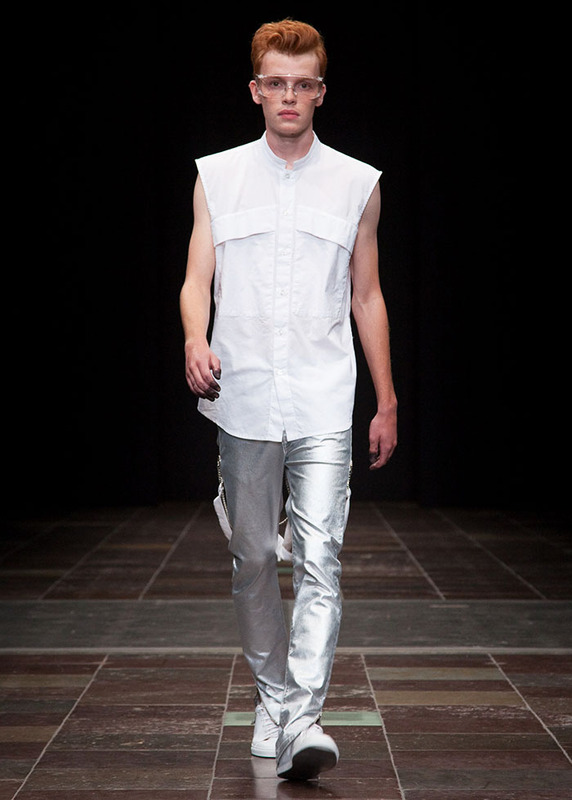 The Oslo-based hot young fashion brand Mardou & Dean presented their first international show this season in Copenhagen, with a parallel women’s and men’s collection. The collection was a fantastic mix of wild, wearable pieces with strong industrial references using woven metallic fabrics together with leather, denim and velvet details. The palette was mostly grey, white, gold and silver. And although some of the silhouettes on the catwalk could be described as androgynous with both masculine and feminine touches, we could also find some softer pieces such as tight-fitting dresses and puffy sleeves. 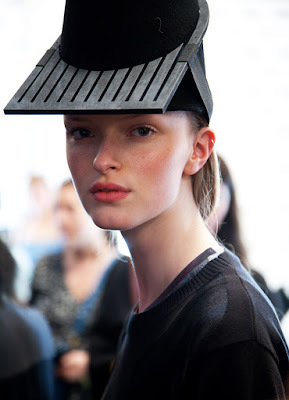 An eccentric touch were the protective plastic goggles that added a futuristic vibe to the collection. Baum und Pferdgarten offered a sophisticated collection as always, with classic elegance mixed with some eclectic and daring garments. It was a more “grown up” collection than what we have seen before: blazers played a key role, and although it was a women’s collection there were some menswear influences, like the collared dresses and masculine-feminine combination of a boyfriend blazer. The collection was very wearable, the fluid silks and lightweight chiffons were combined with bold patterns, Victorian inspired details and exaggerated turtlenecks. We especially loved the use of lace in both the long skirts and pants that added an element of glamour. This seasons’ catwalks at Copenhagen featured some standout hair and make-up looks from glamorous retro waves to graphic eyes. Here are some of the looks that caught our attention: wet-look hair was clearly a trend and it appeared again at Barbara I Gongoni with side-parted waves, teamed with dramatic smudgy eye make-up. 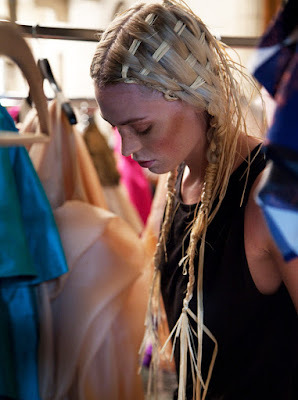 We loved the basket-weave braids at Nichols Nybro and can easily see this look as a fun hairstyle for a special summer party. Effortless chic is always in style and at Mark Kenly Domino Tan a bright orange lip was simply featured on an otherwise bare, fresh face. 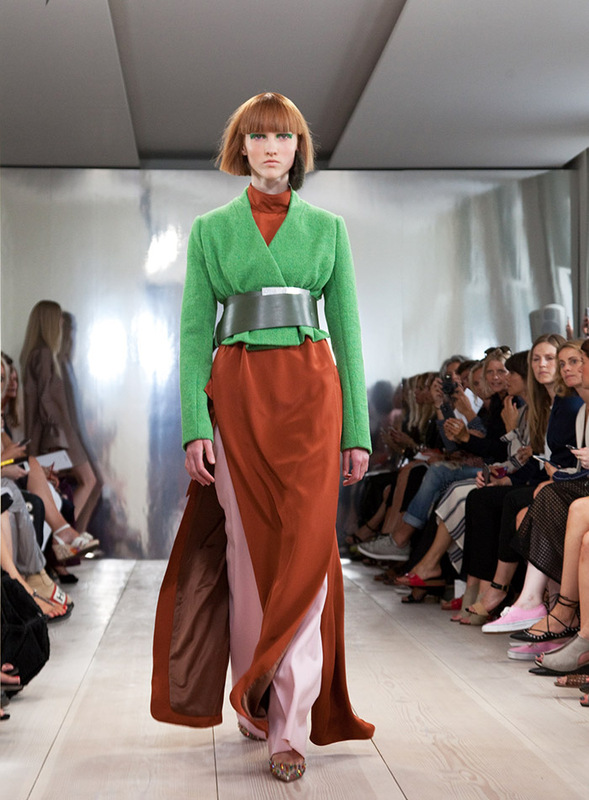 Another key look on Tan’s runway was the bold green eye makeup in clean, graphic shapes. 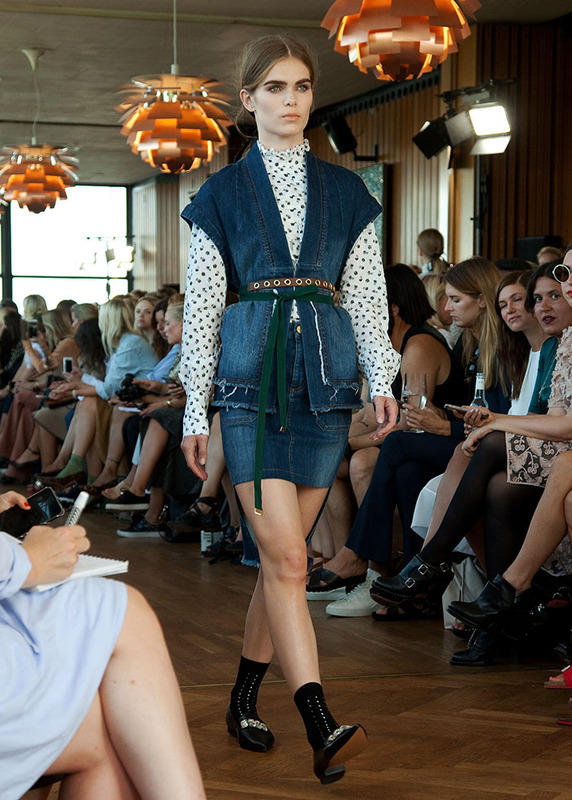 This season in Copenhagen showed that Scandinavian fashion is full of creative and original designers and the design future in this part of the world looks to be an exciting one. 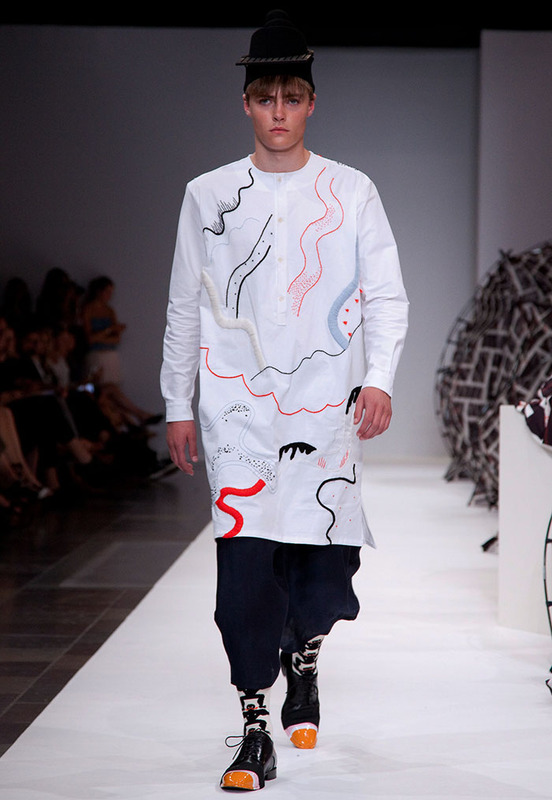 Bold geometric patterns, abstract prints, swirling lines and burnt orange, pink and black brogues at Henrik Vibskov. Photograph by Jesper Bang-P Thortzen. Floating dresses with sea like motifs at Henrik Vibskov. Photograph by Jesper Bang-P Thortzen. 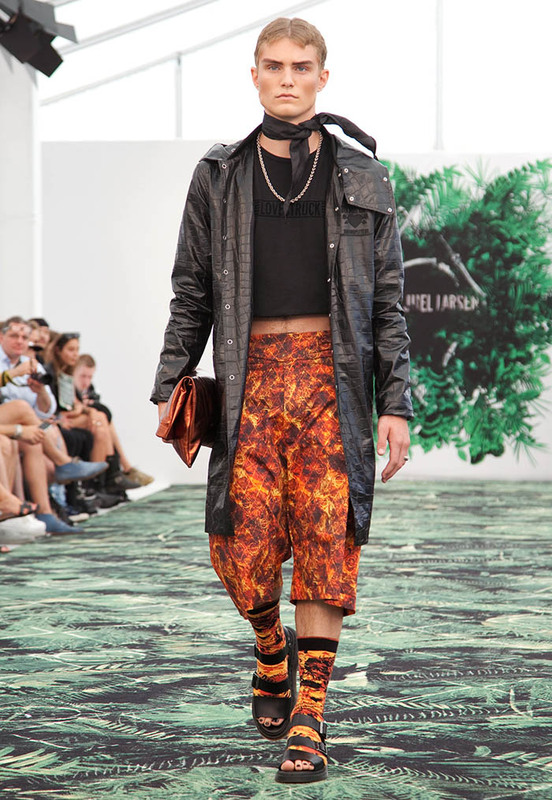 A whimsical mix of jacket, scarf, shorts, sandals and socks at Asger Juel Larsen. Photograph by Jesper Bang-P Thortzen. Black mixed with brilliant prints at Asger Juel Larsen. Photograph by Jesper Bang-P Thortzen. Backstage at Asger Juel Larsen. Photograph by Jesper Bang-P Thortzen. Clashing colours but matching prints at Asger Juel Larsen. Photograph by Jesper Bang-P Thortzen. 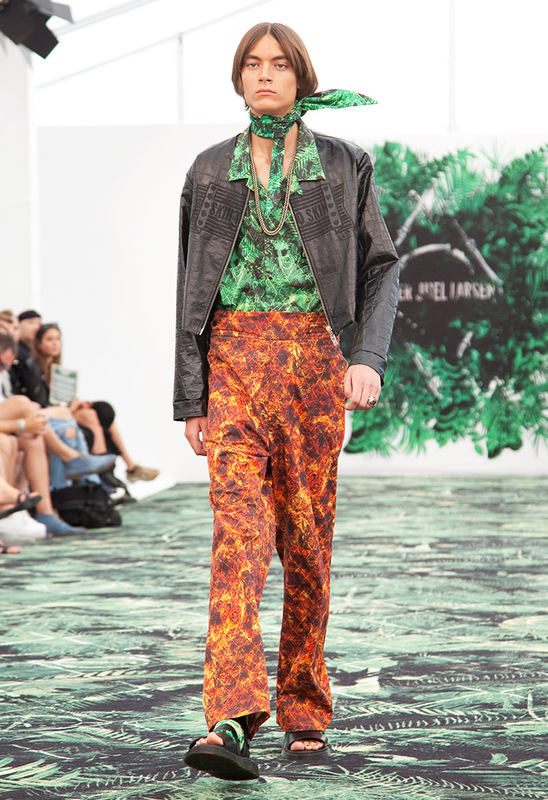 Jungle prints, sandals and short shorts at Asger Juel Larsen. Photograph by Jesper Bang-P Thortzen. 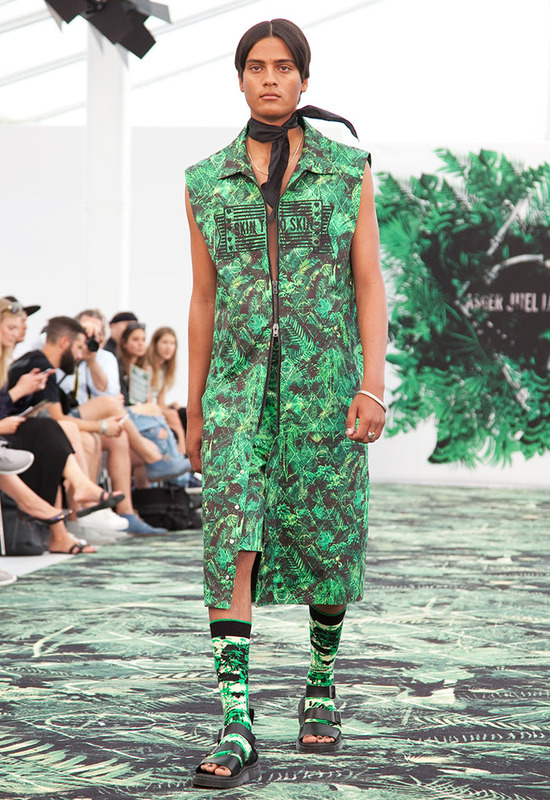 Ferny green ensemble at Asger Juel Larsen. Photograph by Jesper Bang-P Thortzen. Dramatic black evening gown with fur earrings by Mark Kenly Domino Tan. Photograph by Jesper Bang-P Thortzen. 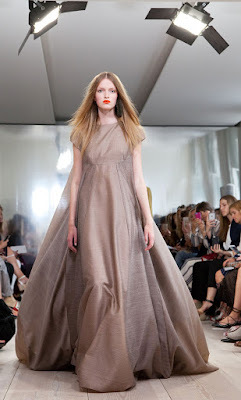 All in grey with a dash or orange lipstick at Mark Kenly Domino Tan. Photograph by Jesper Bang-P Thortzen. 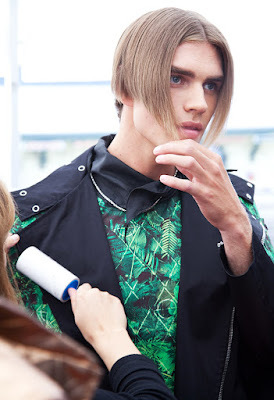 Futuristic oriental inspirations at Mark Kenly Domino Tan. Photograph by Jesper Bang-P Thortzen. 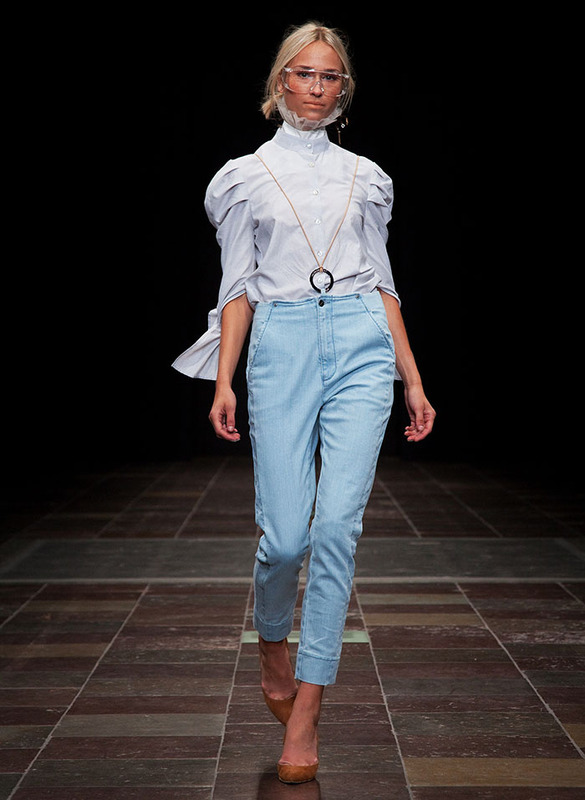 Pale denim and perspex glasses at Mardou & Dean. Photograph by Jesper Bang-P Thortzen. A splash of orange to enliven a 70s colour combo of green and Mission brown at Mardou & Dean. Photograph by Jesper Bang-P Thortzen.